I am going to change the antifreeze and flush system. Do I have to use Motorcraft Antifreeze and flush (very expensive)? Local box stores don't even carry Motorcraft. 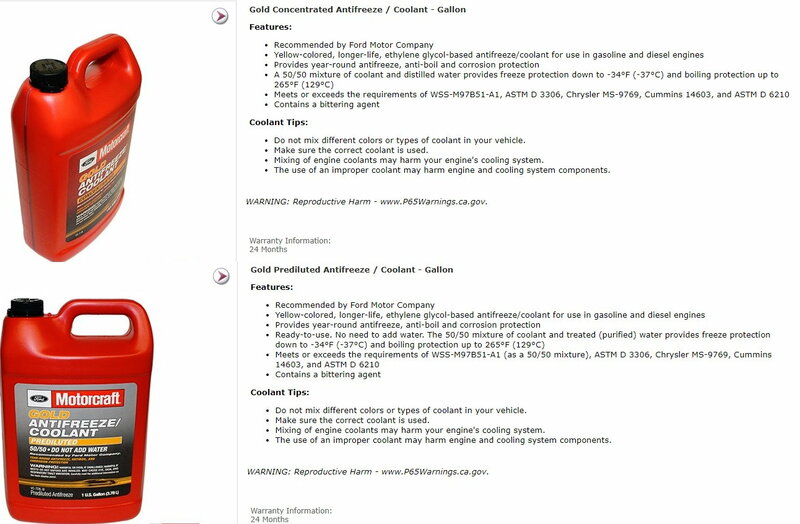 They list compatible (with all types of colors) Prestone Antifreeze and different types of flush. I'm confused!!!!!! Anyone with suggestions as how to flush and type of products to use? I have flushed other older (60's-70's) vehicles with no problems. 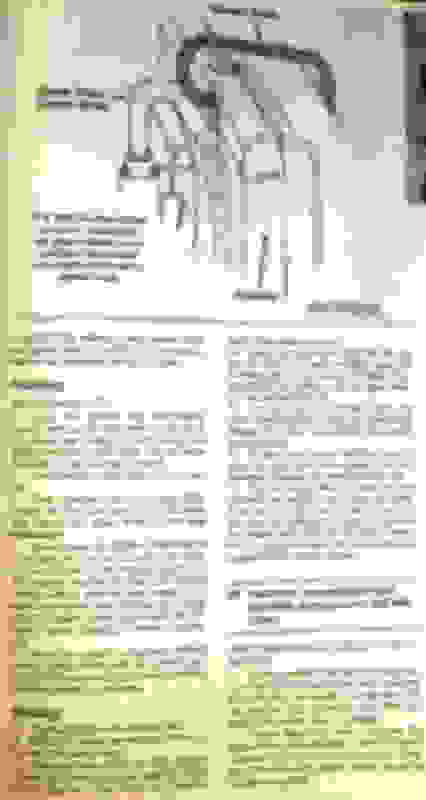 Owners manual says to use VC-7-A Gold (WSS-M97B51-A1). Can't find anyone that even carries that product. Can find VC-7-B (again very expensive) over $25.00 a gallon. Give me some ideas on what you did and how much pure (100%) antifreeze to add after flushing block, radiator, lines and etc. Do I have to use distilled water to flush? It would take many gallons of distilled water to do a complete flush and drain. All ideas and suggestions appreciated. Thank you in advance!!!!! Make sure the heater is on when you are flushing. Regular Prestone long life is as good as any. The only antifreeze you should NOT use is Dex-Cool. Look up the capacity of your cooling system in your owner's manual and you will need half that amount of 100%. Distilled water is less than a dollar a gallon. It's too cheap to take the chance on using tap water in my opinion. This is coming from a guy who long ago plugged up a heater core by using hard tap water. Are you saying.....Use distilled water for the complete flush? It would take a lot of gallons of distilled water feeding it through the small opening in the plastic tank with the truck running, heater on and draining out the bottom radiator drain. Did you look at the flush kit I linked? You don't run water into the tank when you use it. Sorry, Roadie - I will never waste my money on distilled water flushing. None of the shops I've ever dealt with use it. I maintain that quality antifreeze will protect a cooling system for 3 years with tap water. None of the shops I've ever dealt with use it. I maintain that quality antifreeze will protect a cooling system for 3 years with tap water. I have seen 1 shop use distilled water. Many gallons. A lot of extra work. Exactly as you would imagine. More labor. And they charge for the distilled water at a mark-up. This shop charges for a service like you would do yourself at home. New hoses & thermostat. I know the guy who owns the shop. His outlook is that he wants to completely exchange all of the fluid and clean the system. The OEM specifies distilled water for a reason. And he wants the customer to drive off with properly mixed new coolant, new hoses, new thermostat. Not like other shops that mix whatever cheap antifreeze they get in bulk, only drain the radiator, and the customer eventually has to come back when the old hose burst or the old thermostat is stuck. You wouldn't do a "half-***" job on your car. And you should never pay someone to do a "half-***" job on your car. Do I have to use Motorcraft Antifreeze and flush (very expensive)? Local box stores don't even carry Motorcraft. You can do whatever you want. Owners Manual also says to use Mercon V. Plenty of people use other ATF. Some with more success than others. If you don't use the OEM specified fluid, and follow the instructions to dilute with distilled water......if you develop a problem later, you will think back and wonder if that's why. MotorCraft Gold comes in concentrate, and prediluted so that you don't have to mix it. It is also available online. Shop the part numbers around and find the best price. You should be able to walk into any dealership and buy it over the counter at the dealership mark up pricing. I usually go through the distributor, if I can't wait for shipping, but it's still not cheap. Your options are to follow GLC's instructions and buy one of those kits, do whatever you have always been doing, or try something different. 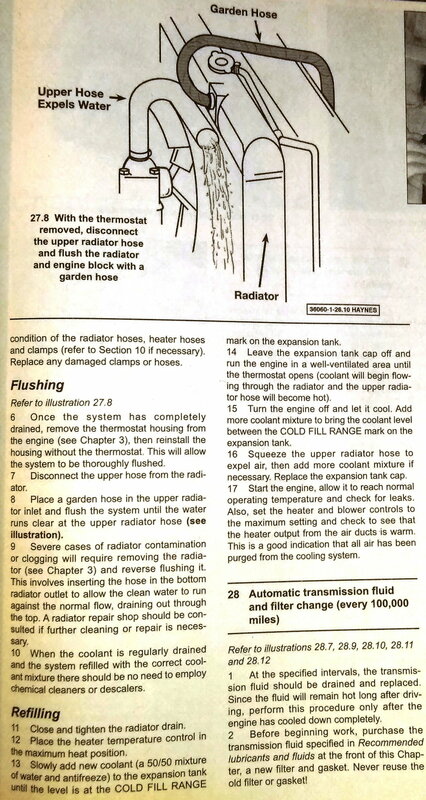 Here's a pic from the page in the Haynes Manual of coolant flush. There si a good video online. You could simply drain the radiator and overflow tank, refill, and and maybe repeat that annually. Or drain the radiator, remove the thermostat, add distilled water, run engine, drain, and repeat until it's clean. Then drain again, install new thermostat, install new hoses, and add coolant to proper mixture. Good luck with whatever you decide to do. Keep us updated. Maybe post some photos. Good write up! I will be doing mine in the spring and will refer back to this. Why wait? Your truck is 10 years old. 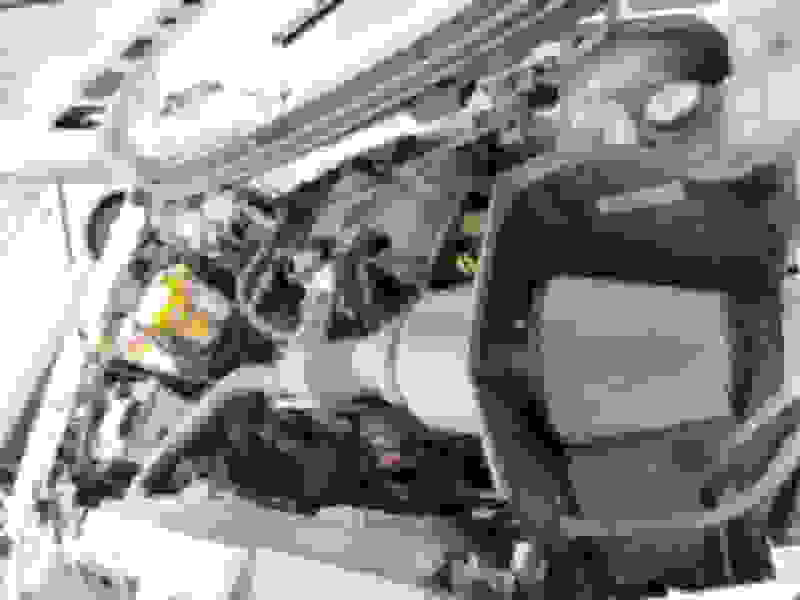 In the above image, the upper radiator hose is removed, and coolant is allowed to flow out, spray everywhere, and leave a big mess. Try using a length of tubing. Attach tubing to engine in place of upper radiator hose, and run the other end into a 5 gallon bucket or water bottle. Now you won't have poisonous coolant all over your garage floor, in your driveway, and running into your storm drain.